A hurricane’s track depends primarily on the winds that steer it, and these winds are forecasted with atmospheric models. The hurricane’s energy source, however, comes from the ocean. Sea surface height is a useful measure of potential hurricane activity because storm-fueling warm water is higher than surrounding cooler water. 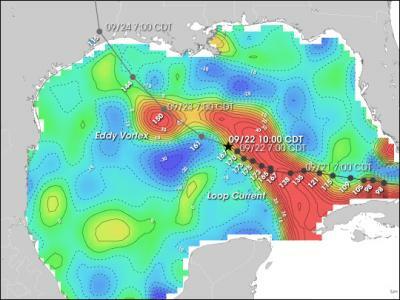 The area shown in red is approximately 35 to 60 centimeters (roughly 13 to 23 inches) higher than the surrounding Gulf. The previous article is Hasta La Vista Allchin. The next article is What happens when you hit 48?.